Yellow Rice is rated 3.9 out of 5 by 23. 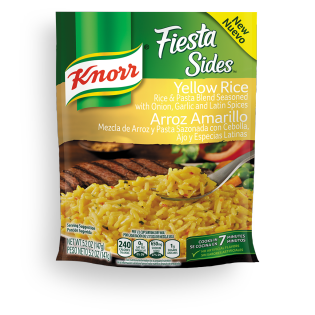 Rated 5 out of 5 by Dodi from Fiesta Sides - Yellow Rice Yellow rice is not my favorite but this rice with the Pasta Blend Seasoning with Onions, Garlic and Latin Spices was absolultey delicious. I want to thank you for sending me the free sample as I would have never bought the "yellow" rice. I had it with a side of Pork Chops and fresh green beans. I would try it again. Rated 4 out of 5 by mic9890 from Good Rice Overall, this rice is okay/good. I'm a HUGE fan of the Mexican Rice and comparing this flavor to the Mexican rice, it is the same with less flavor. I may purchase this again in the future, but the Mexican rice is much more flavorful than this yellow rice. Rated 5 out of 5 by drkim from Family Favorite I received this item free to try.Perfect as a side dish or entree. You can add tofu or meat to it and have a fast meal. It tastes delicious. Keep a few packages in your pantry for a simple meal anytime. I make a package---adding nothing---as a meal. Rated 5 out of 5 by IRDS from Super Side Dish I was rushed on time so I came home with a store bought rotisserie chicken. I made the yellow rice as a side & my family ate it so quickly & asked if there was more. So tasty & moist. From now on I will buy 2 packages for 1 serving at family meals.